Does society feel like a certain dystopian novel you read in high school? Who knew Trump was the fountain of youth? Hopefully this little reference made you smile in a very questionable and uncertain time. This A2 card is hand drawn and printed. It comes with a coordinating envelope (colors may vary) and a protective cello sleeve. It will ship via USPS First Class mail in a cardboard mailer. 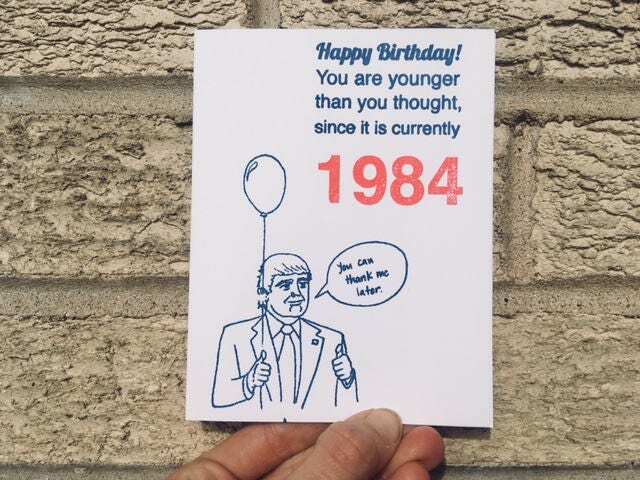 Perfect card for my Mother's Birthday this month. I think she will appreciate the humor, with the current state of affairs, we could all use a good laugh. Thank you! Love this card and can't wait to give it to the birthday recipient. Thanks so much! !